By use of this website (the “Site”) of QUIKRETE® Holdings, Inc. (QUIKRETE®), you agree to all of the terms, conditions, and notices contained or referenced in this Site (the “Terms and Conditions”). If you do not agree to these Terms and Conditions, do not use this Site. QUIKRETE® reserves the right to update or revise these Terms and Conditions. Your continued use of this Site following the posting of any changes to the Terms and Conditions constitutes acceptance of those changes. The content of this Site is protected by copyright. You may not copy, distribute, or create derivative works from any part of this Site (including its graphics, pictorial matter, and text) without the prior written consent of QUIKRETE®. QUIKRETE® is a registered trademark of QUIKRETE®. Other names, logos, designs, titles, words, or phrases within this Site, including but not limited to QUIK-TUBE®, THERMO-LUBE®, TRAFFIC TOP®, and TUBESAND®, are trademarks, service marks, or tradenames of QUIKRETE® and may not be used without the prior written permission of QUIKRETE®. QUIKRETE® claims no interest in marks owned by other entities not affiliated with QUIKRETE® which may appear on this Site. No hyperlinks to this Site are permitted without QUIKRETE®’s prior written consent. QUIKRETE® has no control over and accepts no responsibility for the content or performance of third party websites. Any links to third party websites are not an endorsement, sponsorship, or recommendation of the third parties or the third parties’ ideas, products, or services. Similarly, any references in this Site to third parties and their products or services do not constitute an endorsement, sponsorship, or recommendation. No Guaranty of International Service or Compliance. This Site was designed for and is operated in the United States. Accordingly, this Site may contain references to QUIKRETE® products or services that are not available in your country. Such references are not intended to announce such products, services, or programs in your country and QUIKRETE® makes no representation that access to the Site is permitted under the laws of nations other than the United States. You are responsible for compliance with applicable local laws and access to the site is prohibited anywhere such access would violate local law. The material in this website is provided “as is,” without any kind of warranty, either express or implied. 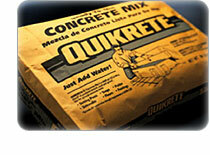 The material on this website is not a warranty as to any product or service provided by QUIKRETE®. Warranties, if any, accompany the product or service when purchased by a customer. QUIKRETE® is not liable for any errors, delays, inaccuracies, or omissions in this site or any sites that are linked to, or referred to by, this site. Under no circumstances shall QUIKRETE® be liable for any damages, including indirect, incidental, special, or consequential damages that result from the use of, or inability to use, this site whether based on actions in contract, tort, negligence, strict liability, or otherwise, even if QUIKRETE® has been advised of the possibility of such damage. You and QUIKRETE® agree that the laws of the State of Georgia will apply to all matters arising from or relating to use of this Site, whether for claims in contract, tort, or otherwise, without regard to conflicts of laws principles. You and QUIKRETE® also agree and hereby submit to the exclusive personal jurisdiction and venue of the State Court of Fulton County, Georgia, and the United States District Court for the Northern District of Georgia with respect to such matters. These Terms and Conditions constitute the entire agreement between you and QUIKRETE® with respect to your use of this Site and supersede all prior or contemporaneous communications and proposals, whether oral, written, or electronic, between you and QUIKRETE® with respect to this Site. If any provision(s) of these Terms and Conditions are held invalid or unenforceable, those provisions shall be construed in a manner consistent with applicable law to reflect, as nearly as possible, the original intentions of the parties, and the remaining provisions shall remain in full force and effect.